Are some histories better left buried? One of the individuals you’ll likely never see in a science textbook is the researcher (and resurrector) Dr. Robert Cornish (1903-1963). His story of somewhat successful reanimation begins in the 1930s with a series of dogs all dubbed Lazarus and ends with a California prison. 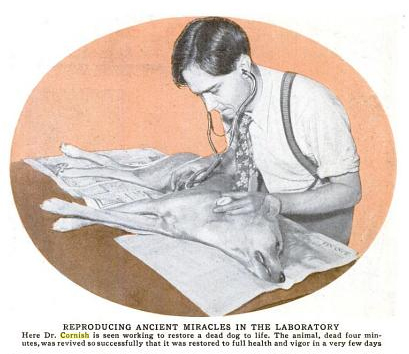 An image of Robert Cornish from Popular Science, February 1935. Cornish was a child prodigy, graduating from the University of California, Berkeley at the age of 18. By the time he was 22, Cornish had his doctorate and had already begun experimenting with a series of different projects. None sparked his interest so much, however, as his forays into the idea of bringing the death back to life. In 1932, the scientist developed a curiosity about whether or not he could start a heart beating after it had already stopped. Cornish wasn’t the first to consider these experiments–in the 1900s, Dr. George Washington Crile had already set the example. Through adrenaline, chest massage and saline solutions, Crile had managed to revive dogs after death. His method failed. While the heartbeat resumed, Crile’s test subjects died a second time moments later after blood clotting set in. Fox terriers were the subjects chosen by Cornish for his experimentation. He dubbed each dog “Lazarus” after the Biblical figure resurrected by Christ days after his death. (Later on, the dogs would be dubbed by the press “Lazarus I,” “II,” “III,” etc. Cornish seems to have made no such distinction.) His initial funding was supplied by grants, his laboratory based out of a barn-like campus structure on the University of California. Each one of the dogs in Cornish’s experiments was killed using a nitrogen gas mixture and left clinically dead for six to ten minutes before any attempts to revive them were made. Each dog was placed on a “teeterboard,” a seesaw-like contraption upon which it was strapped. Cornish opened one of the thigh veins, injecting a saline solution saturated with oxygen that contained adrenaline, a liver extract (heparin) and canine blood. As he performed CPR on the animal, an assistant rocked the teeterboard back and forth to stimulate heart motion. The first three canines resurrected this way came to life only briefly, slumping into comas thereafter. The first dog lived 8 hours, the second 5. For the third Lazarus experiment in 1934, Cornish switched his solution, adding gum-arabic to keep the heart from overworking. Still not convinced of failure, Cornish tried again. Lazarus IV managed to show remarkable improvements over III, with nearly normal pulse, elevated blood pressure, and the ability to eat liquid food. It learned to bark, crawl, sit up and managed to consume meat after thirteen days had passed. It was blind and unable to stand. Dr. Cornish demonstrates his scientific method. Modern Mechanix, February 1935. It is not reported what the elder Cornishes thought of this idea. The backlash against Cornish wasn’t contained to the university–several members of the public complained as well. The scientist debated about switching test subjects from canine to swine, explaining “hogs more nearly resemble humans in their digestive and circulatory systems and have far fewer friends than dogs.” But he continued conducting experiments with fox terriers, now in his home rather than the laboratory. The fifth Lazarus recovered more rapidly in four days than the fourth had in thirteen. In neither case, however, did the dog resume a normal life. The state of California had different ideas. Cornish’s request was considered but there was determined to be one flaw with the plan. The petition was denied, not because of the immorality of experimenting on prisoners but because legal opinion differed on what McMonigh’s legal status would be after resurrection. Would a prisoner killed and then brought back to life still be subject to the death penalty? What kind of precedent would it set? This marked the last of Cornish’s experiments to reach the public’s attention. This wasn’t the weirdest of Cornish’s Hollywood connections. 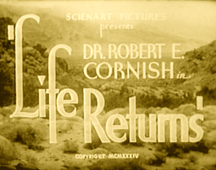 The film, Life Returns (1935), was heavily inspired by the work that the scientist had done. 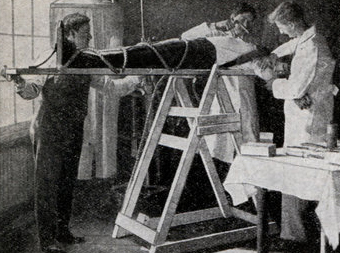 In fact, actual footage from Cornish’s experiments was inserted into the end of the film. The resurrection of Lazarus was spliced with clips of actors playing the roles of doctors and nurses searching for an end to death. For the most part, these movies are what remained of the work of the little-known Cornish. While his predecessor Crile went on to other avenues of scientific research, Robert Cornish ended his days by developing and selling his own brand of toothpaste. His resurrection studies are now buried in the dusty pages of old magazines. Though Cornish’s work is not easily found, traces of it can be glimpsed by searching the Google News Archive. Of particular note may be the following magazines which feature stories about Cornish and his canine experiments: Popular Science (February 1935), Modern Mechanix and Invention (July 1934 & February 1935), and LIFE magazine (1934-35). The entirety of the film Life Returns can be viewed and downloaded at the Internet Archive. Footage of the actual experiment begins at around 48:25 (please note: it is not for the squeamish). 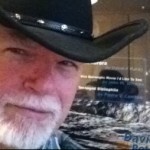 2 thoughts on "Lost Curiosities: Bringing Dogs Back from the Dead"
Great article. Cornish was completely new to me, though I’d seen The Man They Could Not Hang. I wonder whether Jimmy Sangster knew of Cornish when he devised the sequence in which Frankenstein revives a dead dog in The Curse of Frankenstein.